Goddess Bhairavi is incarnation of Goddess Parvathi. She is furious form of goddess shakthi and is evaluated with the Lord Kalabhairavi the one of the manifestation of Lord Shiva. With her fierce appearance she made all evil force and demon completely weak by seeing her angry form. Goddess Bhairavi provides her devotees with the power to improve their strength level to fight against evil effects in life. Bhairavi Homam is very helpful for an individual to keep away from any panic or dread. Those who offers prayer to Maa Bhairavi Devi with complete belief and whole heartedly will definitely blessed with long life without any troubles from black demons or evil forces. By performing Bhairavi homam an individual can attain complete protection against evil forces or black demons. 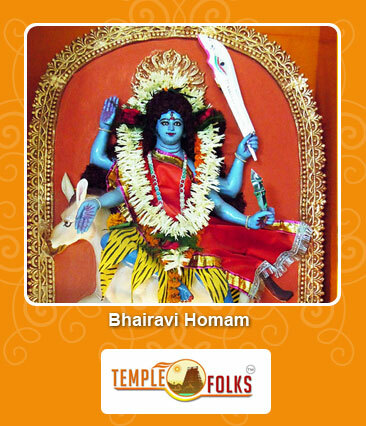 Goddess Bhairavi blesses her devotees with long life. Bhairavi homam is well recommended for those who want to get peace of mind. Bhairavi Homam helps to control any complicated situation in life by providing exact needs. Performing this homam helps to get relief from any obstacles or hindrance in life. Helps in improving the courage level to attain success in all endeavors. 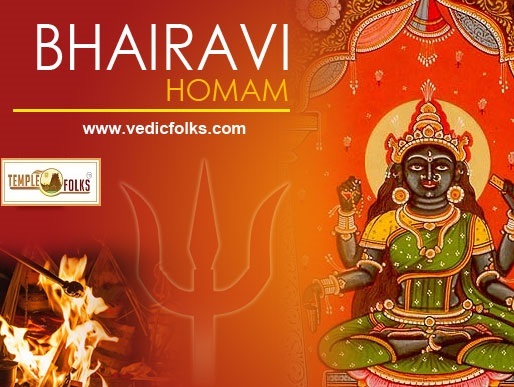 To get all the bounties and experience the enormous integrity of Bhairavi Homam (fire customs or lab), you can get the assistance of our accomplished Vedic Purohits (intellectuals) at Vedicfolks.com on the web.